Save the Date! 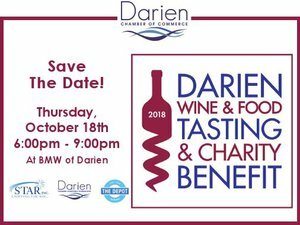 Darien Chamber has announced that Darien Wine and Food Tasting & Charity Benefit is planned for Thursday, October 18 from 6 to 9 pm at BMW of Darien. Taste the best gourmet foods in Darien along with over 55 selected wines and shop the silent auction while seeing friends from all over town. The proceeds of the event this year will go towards STAR, Inc-Lighting the Way, The Darien Chamber Charitable Foundation for Scholarship and the Darien DEPOT Youth Center. Tickets are $65 in advance and $90 at the door. Sponsorships are available and please call the Chamber office at (203) 655-3600 if you have an auction item you’d like to donate.